For the first time in five years I’m back in the Great White North for the NHL Heritage Classic, visiting my fifth province in Manitoba from Chicago- a place that widely celebrates the Fifth Province. There’s definitely more Irish heritage in the city along Lake Michigan, but I’ve had quite the hockey time in the big town just outside Lake Winnipeg. The journey was a 700+ mile/ 12.5 hour trip by car that I split into two days on the road. 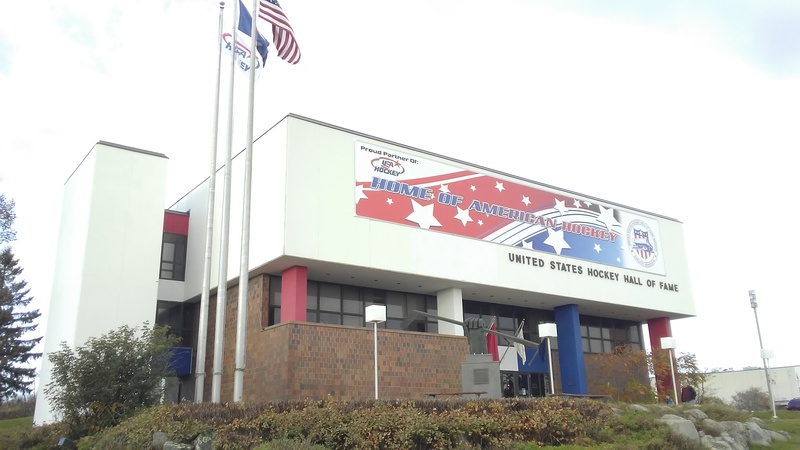 Now I could have gone the shorter route with all interstates, passing through historical college hockey territories of the Badgers, Gophers, Huskies and Fighting Sioux. 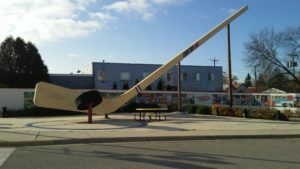 But since it’s been over 15 years since “The Great One” and I were in the same barn in Colorado, I decided to make a slight detour to Eveleth, Minnesota. It was my first time ever visiting the US Hockey Hall of Fame, never forgetting the “lucky loonie” prank Wayne Gretzky played out at the Vancouver 2010 Olympics. As I’ve said since my arrival Friday afternoon, Winnipeg is the smallest big city I’ve ever visited. With a skyline not as tall as Calgary or Vancouver nor a culture as diverse as Toronto or Montreal, “The Peg” is flat out friendly. And I’m not just saying that after beers at The Pint or free parking downtown daily after 5:30pm. 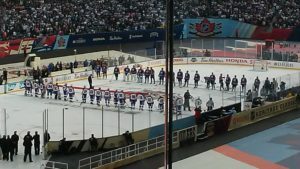 Today after the Winnipeg Jets and Edmonton Oilers practiced under mostly sunny skies, 31,317 fans split about 60/40 for the home squad filled the Winnipeg Blue Bombers stadium for the alumni game. Bearing a striking resemblance to the clamshell design of CenturyLink Field in Seattle, Investors Group Field pulled out a few nostalgic surprises including the original mascot Benny the Jet (Elton John anyone?) and a picture of Queen Elizabeth on the jumbotron that used to be in the old Winnipeg Arena. This year’s alumni game was probably the best I’ve ever seen trophy-wise on the ice. A total of 9 Hockey Hall of Famers were a part of the game today including Glen Sather and Jari Kurri for the Oilers and Dale Hawerchuck and Serge Savard for the Jets. The action was slower than some legends games I’ve seen, but recently retired Fin Teemu Selanne beat Billy Ranford blocker side on a penalty shot less than five minutes into the first period. it’s been a big weekend for the winger, who was given a key to the city yesterday and talked about it on the bench to the crowd after the goal. A roar of laughter from knowing fans ensued as the action started to pick up. Winnipeg would open up a 4-1 lead after the first period. 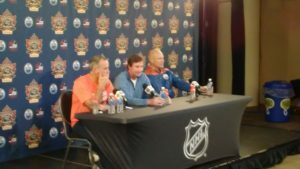 Oilers and Ranger great Mark Messier snipped his second goal of the game in the second frame, and loved being a part of it all. Halfway through the third period after Craig MacTavish’s right circle wrister, the game at 5-5 was heading towards a shootout until the Oilers Craig Simpson tripped #13 in white with 11 seconds left. Selanne finished the game just like he started it, with a penalty shot goal to give him five points on the afternoon on a productive line with Kris King. 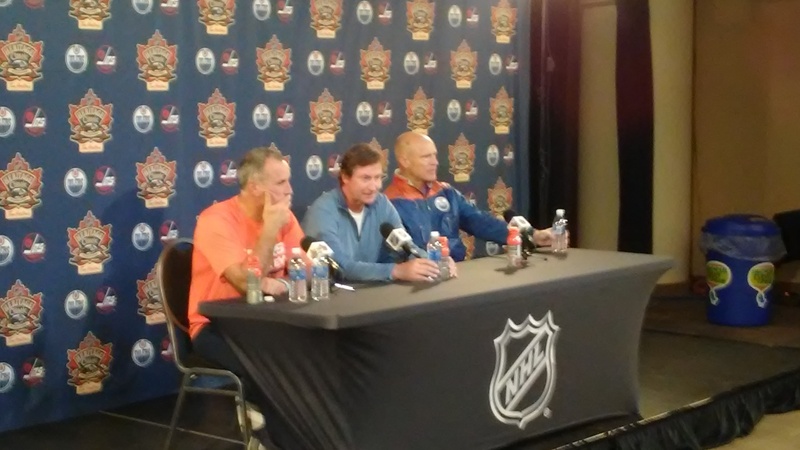 Wayne Gretzky, who is the NHL’s official Centennial Ambassador starting January 1st, talked after about why he only plays once a year at his fantasy camp in Las Vegas. Follow @Sportsology and @JonathanSWest on Twitter the rest of the weekend live from Winnipeg.